In stock -This product will ship today if ordered within the next 15 hours and 4 minutes. 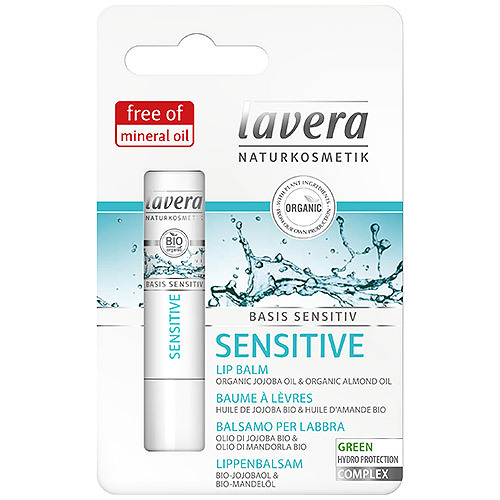 Lavera Organic Lip Balm from the Basis Sensitiv range is an established, popular soft lip balm with organic oils and waxes to keep your lips soft and supple. Organic jojoba oil, organic almond and organic waxes provides long-lasting intensive lip care and protects lips from drying out through the different seasons as well as harsh winter weather. 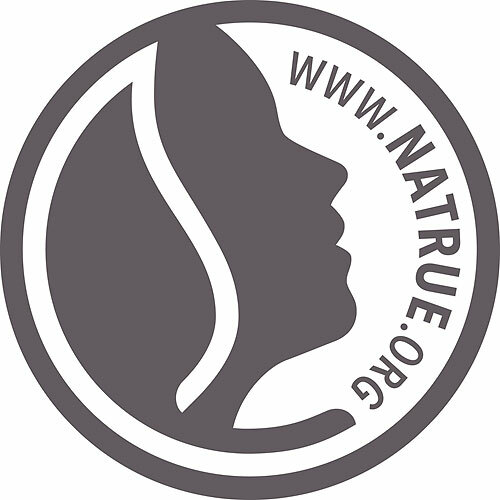 Organic Jojoba and Organic Almond Oil are used to soothe lips. Helps prevent lips from cracking and keeps them moisturised. This lip balm is suitable during pregnancy. Basis Sensitiv provides essential care products for the whole family. With it`s mild and gentle formulations it is suitable for delicate and sensitive skin. Contains: 4.5g of lip balm. Ricinus Communis (Castor) Seed Oil*, Euphorbia Cerifera (Candelilla) Wax, Beeswax (Cera Alba)*, Copernicia Cerifera (Carnauba) Wax*, Glycine Soja (Soybean) Oil*, Polyglyceryl-3 Polyricinoleate, Simmondsia Chinensis (Jojoba) Seed Oil*, Prunus Amygdalus Dulcis (Sweet Almond) Oil*, Hippophae Rhamnoides Fruit Extract*, Olea Europaea (Olive) Fruit Oil*, Arnica Montana Flower Oil*, Calendula Officinalis Flower Extract*, Dipotassium Glycyrrhizate, Tocopherol, Helianthus Annuus (Sunflower) Seed Oil, Ascorbyl Palmitate, Alcohol*, Flavour (Aroma)**, Limonene**. 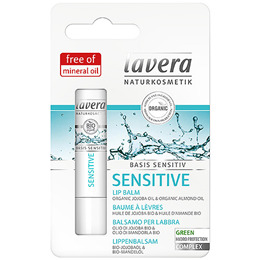 Below are reviews of lavera Organic Basis Sensitiv Lip Balm - 4.5g by bodykind customers. If you have tried this product we'd love to hear what you think so please leave a review. Fast delivery. Lovely quality lip balm. I love the balm and its smell! it leaves my lips soft and moisturized for some hours! Really nice lip balm, love the smell and leaves lips very soft and moisturised ... will definitely buy again! !